-	Regardless of eras, Princess Pyeonggang is used to auction first order next round. -	After you possess Princess Pyeonggang, you increase 2 military forces and 1 political force. -	You increase 1 military force per a hero you possess. -	You increase 1 military force, 1 political force, 1 traffic force, 1 food, 1 money, 1 mineral and 1 victory point. -	When war or threat is declared, you ignore shields of the opposite player. -	Warfare expense is reduced by 2. -	You increase 1 traffic force and 1 political force. -	A number of workers you want are placed on this card. You gain 2 victory point tokens per a worker placed on this card at production phase of every round. -	You increase 1 political force and 1 money. -	Constructed building placed in the wasteland on this card has a double status. -	You increase 2 minerals. -	Limitation of the maximum side of the kingdom is expanded to the size by; 6×6 in the 1st era, 7×7 in the 2nd era, and 8×8 in the 3rd era. -	The food cost of Birth is reduced by 2. -	Other cards aren’t patched on this card. -	When you patch this card, other players remove one of their workers. -	When patch this card, you see prosperity cards of other players. -	When war is declared, you gain 3 food tokens from the opposite player. -	You increase 5 military forces. -	You reduce 1 political force. -	When patch this card, you may pay up to 3 workers you possess. All other players pay their workers equal to the number of workers you pay. -	You gain 7 victory point tokens per a worker you pay. 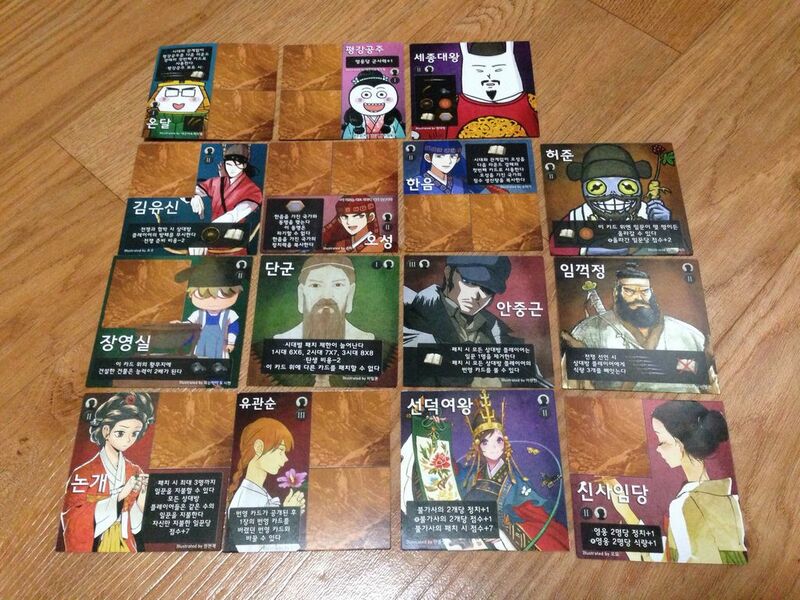 -	After prosperity cards are revealed, you may replace one of them with one of discarded prosperity cards. -	You increase 1 political force per two wonders you possess. -	You gain 2 victory point tokens per two wonders you possess at production phase of every round. -	You gain 7 victory point tokens whenever you patch a wonder card. -	You increase 1 political force per two heroes you possess. -	You gain 1 food token per two heroes you possess at production phase of every round. -	You ally with the player who possessed Haneum. -	This alliance cannot be broken. -	You copy political force(s) of the player who possessed Haneum. -	You increase 1 victory point. -	Regardless of eras, Ohseong is used to auction first order next round. -	You copy victory point(s) of the player who possessed Ohseong. -	You increase 1 political force. Are these cards inside the limited first international (english) edition of the game?